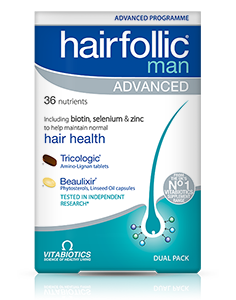 Hairfollic Man is a carefully balanced combination of vitamins, minerals and bio-active nutrients. Each tablet provides micronutrients including biotin, selenium and zinc which contribute to the maintenance of normal hair. Hairfollic Man also includes the exclusive Tricologic Amino-lignan complex. Hairfollic Man delivers its benefits via the bloodstream directly to the hair roots and has been formulated on the basis of the latest scientific research. Each hair follicle is a highly active metabolic "factory"; requiring oxygen, energy and protein synthesis to maintain normal healthy hair. Hairfollic Man includes Tricologic, a proprietary combination of selenium and zinc which contribute to normal hair, plus lignans, amino acids and grape seed extract proanthocyanidins. Hairfollic Man also provides other important nutrients including copper which contributes to normal hair pigmentation. As Hairfollic Man is an orally administered supplement, its benefits are delivered via the bloodstream directly to the hair root and dermal layers of the scalp where they are needed most. 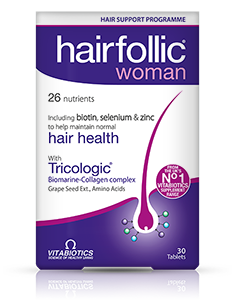 The level of each individual nutrient in Hairfollic Man and precise combination has been developed by Vitabiotics' experts, to maximise its benefits. Hairfollic Man also contains support for your skin and nails, with vitamin C which contributes to normal collagen formation, plus niacin (vitamin B3) which contributes to the maintenance of normal skin. The formula also contains zinc and selenium which contribute to the maintenance of normal nails. The Hairfollic Man formula provides a comprehensive balance of nutrients, including vitamin D which helps to maintain normal bones and folate which helps to reduce tiredness and fatigue. An additional multivitamin is not necessary. Vitabiotics is proud that Hairfollic Man is the only comprehensive supplement officially recommended by leading hair loss expert Spencer Stevenson, whose popular website Spex Hair offers scientifically-based advice to men who are looking to maintain a healthy head of hair. Spencer, also known as 'Spex', is a globally recognised hair loss and hair transplant mentor, who has helped countless people including A-list celebrities by guiding them through the available options for hair maintenance. 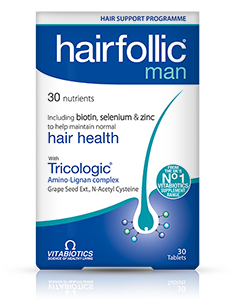 He recommends Hairfollic Man to help safeguard the daily intake of key micronutrients such as zinc, biotin and selenium, which all contribute to normal hair health. To stay up-to-date with the latest news and solutions for effective hair maintenance, visit Spexhair by clicking here. Hairfollic Man can be ordered online here. Ingredients:Maltodextrin, Bulking Agents: Microcrystalline Cellulose & Gum Acacia, Choline (as Bitartrate), Vitamin C (Ascorbic Acid [Carriers: Hydroxypropylmethylcellulose & Tartaric Acid]), Standardised Lignans, Pantothenic Acid (as Calcium Salt), Magnesium Oxide, Vitamin E Natural Source (as D Alpha Tocopheryl Acid Succinate) (from Soya), L-Cysteine, Tablet Coating (Glycerin, Hydroxypropylmethylcellulose, Hydroxypropylcellulose, Caprilic/Capric Triglycerides, Natural Source Colours [Titanium Dioxide, Iron Oxides]), L-Lysine, N-Acetyl Cysteine, L-Methionine, Myo-Inositol (Carrier: Acacia Gum), Niacin (Nicotinamide), Zinc Sulphate, Silicon Dioxide (Colloidal Silica), Para Amino Benzoic Acid, Anti-Caking Agents: Stearic Acid & Magnesium Stearate, Ferrous Fumarate, Thiamin (Vitamin B1 Mononitrate), Vitamin B6 (Pyridoxine HCl), Betacarotene (Carriers: Starch, Water, Antioxidant: DL-Alpha Tocopherol), Riboflavin, Vitamin D3 (Cholecalciferol [Carriers: Acacia, Sucrose, Corn Starch, Medium Chain Triglycerides, Antioxidant: DL Alpha Tocopherol]), Grape Seed Extract, Copper Sulphate, Manganese Sulphate, Folic Acid (as Pteroylmonoglutamic Acid), Sodium Selenate, Chromium Trichloride, Potassium Iodide, Biotin, Vitamin B12 (Cyanocobalamin). Allergy Advice: For allergens, see ingredients in bold. TAKE TWO TABLETS PER DAY WITH YOUR MAIN MEAL. Swallow each with water or a cold drink. Not to be chewed. Do not exceed the recommended intake. To be taken on a full stomach. This comprehensive formula replaces other Hairfollic multivitamins. There is no need to take an additional multivitamin. As with other food supplements, consult your doctor or pharmacist before using if you are under medical supervision, have epilepsy, a thyroid condition, haemochromatosis, suffer from food allergies, or are allergic to any of the ingredients. Made in a site that may handle nuts. Not be taken on an empty stomach. This product contains iron, which if taken in excess, may be harmful to very young children. To protect the ingredients in Hairfollic, always store as directed below. Why has Hairfollic Man been developed? Who can use Hairfollic Man? How and when should Hairfollic Man be used? Can Hairfollic Man be taken simultaneously with medications? Are there any undesired effects whilst taking Hairfollic Man? How long will I have to take Hairfollic Man before I can expect to see benefits? Should I take a multivitamin together with Hairfollic Man? Some Nutrient Reference Value (NRV) levels are above 100% - is this safe? The Nutrient Reference Value (NRV) is the amount of a vitamin or mineral which has been calculated to help prevent basic deficiency states in the general population. However, certain vitamins and minerals at optimal levels above the NRV have consistently been shown to have positive benefits in specific areas of health. This is why some Vitabiotics formulas have certain nutrient levels greater than 100% NRV. All Vitabiotics products have been developed using the latest research and contain effective levels of vitamins and minerals while avoiding any excessive amounts, in accordance with official upper safe limits for vitamins and minerals. "I took these tablets to the recommended dose as on the box and they worked brilliant when I had my radiotherapy consultation they were surprised how quick it had grown back. After I stopped taking them to concentrate on different vitamins they slowly started dropping out again so for me they definitely worked." "Two years ago my hair started falling out; GP visits and blood tests could not establish the cause. 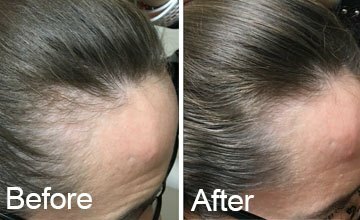 I tried one hair loss product after the next, but nothing made a difference. Hairfollic was just another product I was going to try and I was genuinely surprised when I noticed reduced hair loss within a couple of weeks of taking this product. 5 weeks later and my hair continues to improve. " "WHEN I CAME TO KUWAIT FROM INDIA I GOT SEVERE HAIR LOSS DUE TO WATER. LATER A DOCTOR PRESCRIBED WELLMAN HAIRFOLLIC MAN TABLETS, I HAVE SEEN THE RESULTS VERY QUICKLY, NOW MY HAIR GROWS VERY FAST AND LOOKS AWESOME .. THANKS TO VITABIOTICS... "
"I have been taking Hairfollic Man for 3 months, I now don’t wear a baseball cap everywhere, yes they work"
"I am a 36 years old woman and I started to take the tablets for more than a month now, I can see a massive improvement and a lot of difference in my hair"
"Hair fall started out of the blue, tried oil, shampoo's, deep treatments and nothing seemed to be helping! Finally met with a doctor who advised I try these, its been close to 4 months of usage now and I can honestly say that this product has helped considerably! I still do have hair fall yes, but nowhere as bad as before. I tend to skip a few tablets every now and then and thats when I realise how much of a difference the product makes. Must Buy! " "Fantastic product. I’ve been talking it for just over two months and can see such a huge change in my hair. The texture, its thicker, softer, shinier, more volume, easier to manage. I started taking Hairfollic because I noticed my hair was thinning and lacked shine and lustre. These tablets really put my hair back on track and I will take them for a total of six months. I am so happy with this product and recommend it to anyone who needs to boost their hair. Thank you Vitabiotics." "I just thought I would say that I have been impressed with the “Hairfollic Man" supplements for hair growth and condition. I have only been using these for a month and my hair looks great, (also commented on by my partner!) many thanks." "I am a 50 + woman who had always taken good care of my appearance and been interested in optimum health. However in recent years my hair started falling out, and with every wash I became more and more anxious with the amount of hair that came out. I questioned my hairdresser, who said it was ‘normal hair loss’ even though I knew it not to be so. I tried various supplements and none helped….then several months ago I saw Hairfollic Woman in Boots and bought some. I noticed a reduction in the amount of hair loss with each wash, and this continued to be the case ever since. I would not hesitate to recommend this product, as it is one of the few on the market which actually does what it claims- THANK YOU !! " "I faced the problem of strong hair loss 2 years ago, but didn’t recognise it. I tended to explain it as a seasonal hair loss. Finally, the situation became critical and I started panicking. 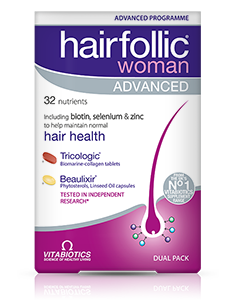 From my friend I learnt about Vitabiotics, and started to use Hairfollic 2 months ago. Nowadays, I see that not only a hair loss has stopped, but much new hair grows....It’s amazing! I recommend it to everyone!" Always read the product directions before use. Do not exceed the recommended intake. As with other food supplements seek professional advice before using if you suffer from food allergies, and consult your doctor or pharmacist if you have an underlying medical condition. Vitamin supplements are not intended to treat or prevent any disease. Food supplements must not replace a balanced and varied diet, and a healthy lifestyle. Do not use if you are allergic to soya. This product contains iron, which if taken in excess may be harmful to very young children.